Welcome to tiny Winona State University in Minnesota, where the Warriors host L4L's San Juan Sharks in the first round of the ATL western playoffs. Warrior coach Soy has the call on game rules, old school (handchecks and no zones) or new school (zones, no handchecks). Starting 5's must be announced at least 24 hours before tipoff. No bait and switch of start a guy then immediately bench him. A player starts he is out there for at least the first 8 minutes. The winner plays the victor of Los Angeles vs. Barcelona. WSU has decided to play by the new-school rules. Also, if Bowen tries anything, Oakley will make him wish he was starring in R. Kelly's next home video. Number in parentheses or less and the player is out. Number after that is the random number drawn. Random number does not reflect % of health. If the player is healthy he's 100%. ATL newcomer L4L here. When analyzing Winona and San Juan, one would probably conclude they are polar opposites. Winona focuses, primarily, on young, new school athletes with dominant individual offensive abilities. San Juan, however, has constructed a team of gritty veteran defenders, former NBA champions, and, above all else, quality defenders. Even though it may seem like these two organizations should switch locations based on their playing styles, San Juan has set out to prove that experience, defense, and a well-woven team fabric STILL triumph over a collection of uber-talented players who are used to controlling the ball. Without further ado, let’s talk hoops. General: Based on defense, proven veteran champions (5 in the rotation, 4 in the clutch line-up, and 3 in the starting line-up). Impeccable perimeter defense and highly respectable interior D though probably not on the same level as the perimeter. A team that will rely on defensive intensity, offensive quickness, outside shooting, and a healthy dose of their main horses to win as a unit. Chauncey Billups: Chauncey’s game is all about strength, size, and the fundamentals. His high post iso game game reminds me eerily of Kobe Bryant’s and most PGs are just utterly helpless to stop it. 2nd All-NBA and 2nd Team All-Defensive in a league with Nash, Kidd, Davis, and more in 05-06. Certified zone buster shooting .433 3P%. Often uses his great length and strength to defend SGs in Detroit. Sidney Moncrief: One of the best defenders perimeter pressure defenders of all time. Just ask Michael Jordan. In 1984-85, which was out of Sidney’s defensive prime, when they met in the playoffs, Jordan put up 29ppg on 44 FG% (coming from a guy who averages 33 on 49 FG% in the playoffs for his career). In 1982-83, he was 3rd in the league in FTA; he could slash with the best. Moncrief complimented the slashing game with an ungodly efficient mid-range game (52 FG%) He was also incredibly quick, athletic, and jumped out of the gym. Chris Mullin: Mullin, in 1991-1992, was playing Nellie ball. With one of the smallest line-ups ever, basically, they HAD to run and chuck to survive. Mullin is not a chucker. He is one of the purest shooters ever. In this offense, Mullin will have his feet set on kick outs instead of taking pull-up threes in transition. Thus, his 3P% shooting will rise closer to his Indiana levels. Watch the guy’s stroke to see how pure it was. Keep in mind how good Mullin was offensively, and overall, in 1991-1992: he was 1st team All-NBA despite Scottie and Rodman being 1st team and 2nd team defensive while capturing the 2nd and 3rd team All-NBA selections. Mullin was dominant this year. Jack Sikma: Sikma invented the reverse pivot now commonly called the Sikma move; this move is taught to every big man in every big man camp across the country because of how effectively Sikma utilized it in the low post. He was Seattle’s best offensive post option during the championship run and many people feel he out-battled Elvin Hayes. In Games 3, 4, and 5, he had 17 rebounds each. He has the rare distinction of leading the league in FT% as a center. He shot over 90 FT% twice and even show-cased three point range later in his career (not to say I should get him with 3P range only that he was always a good to great shooter for a big man); he had range. Despite only blocking 1.6 shots a game, he was elected to the All-Defensive team in 81-82 (that is how good his man defense was that year) while also leading the league in defensive rebounds. David Robinson: When examining stats, you have to keep in mind how the stats were achieved. In 1993-1994, David Robinson averaged nearly 5 assists per game (1.5 AST:TO ratio) because Coach John Lucas played Rodman down low and Robinson up top from the high post. From this distance, Robinson utilized his range, passing over defenders with his excellent vision and solid passing ability, and took full advantage of his quickness off the bounce to simply beat people to the rim. Robinson is just better face-up than he is with his back to the hoop. When Coach Bob Hill took over, he felt that the Spurs would never win with their best post player playing “soft” away from the hoop. He wanted Robinson to be more physical and play closer to the rim. D-Rob responded with a stellar MVP season in which he dominated every player he was matched up against in the regular season. However, this strategy was exposed in the playoffs, against Hakeem, as D-Rob was shown for what he really is: a mid post player who prefers face-up. Even next to the one of the three greatest rebounders ever (Dennis Rodman) D-Rob grabbed 16.2% of the rebounds available. The years following Dennis' departure, D-Rob grabbed 18.4% and 20.8% respectively. Dennis isn’t in San Juan. Bobby Jones: Bobby’s athleticism is shocking for a white boy (no offense intended). He could GET UP. This is evidenced by his 2bpg/2spg at the SF/PF position. The special things about Jones are, though not necessarily a guy who hit outside shots, his efficiency at 57 FG%, his incredible defense (x9 1st Team All-D), and his ability to always come up with clutch stops. He was known as a clutch stopper; a guy who was better defensively in the last quarter of the game. Bruce Bowen: Bruce, get in the corner. We’ll find you. At 42 3P%, Bruce can help bust zones. Defensively, he’s amazing. He’s been assigned to everyone from Nash, Bryant, James to Dirk. He’s a Doberman off the bench. Quinn Buckner: When Boston traded for him, he was compared to KC Jones who was arguably one of the greatest defenders of All-Time. KC Jones is so good defensively that despite averaging 7ppg/4apg for his entire career, he is in the hall of fame. If KC Jones says a player reminds him of himself defensively, that is good enough for me. Who knows D better than Jones? Dan Roundfield: 1st Team All-D, 2nd Team All-NBA, and one of the first prototype Power Forwards for today’s game. He was super athletic always having to make up for size mismatches in the ABA with quicks and smarts. This is a guy who once had to guard Kareem and other Cs because his team simply had no one else who could do it. At 6’8”, he gave up a lot. It is a testament to his defensive skills he still garnered defensive honors during his career. He had range out to 18 feet and often could be seen putting up 20/10 games. However, Roundfield is most famous for his silent tenacity, workman-like ethic, strength, and toughness. He did the dirty work putting the STOP in defensive stopper guarding positions 3, 4, and even 5 at times. General: Extremely athletic, young, and individually talented. All of these guys can ball when they are the focus of the offense. The team is slightly lacking in the defensive department individually as only Oakley and Thurmond have defensive honors in the years selected. The most pressing problem, in my opinion, is that Winona has a number of VOLUME touch players; guys who need touches to find rhythm and who need rhythm to be effective. Deron Williams: D-Will is strong, explosive, and runs an excellent PnR (side screen Sloan style). He is very quick though not necessarily fast. This year, he expanded his range out past the 3 point line. His on-ball defense is solid, but his off-ball defense has yet to catch-up. 2nd on the Jazz in touches at 23.1% Usage rate. Ron Harper: Harper was an excellent defender… when he went to Chicago. In Clipperland/Cleveland, Harper focused on the offensive side of the ball and was simply not the same caliber of defender. He was an excellent ball-handler and passer for a SG. Remember, the year picked matters. 1st in touches in Cleveland at 23.4% Usage rate. LeBron James: Simply amazing. James has fantastic vision, rebounding ability, and out of this world athleticism. There are few weaknesses in James armor, but the ones present are at key places. Boston was able to take advantage of these weaknesses to force James to be almost utterly ineffective. James cannot and will not post smaller players which allowed the Celtics to use Posey without remorse. See what Cavs fans say on James posting ability (people who have watched his, almost, every move/game): http://www.realgm.com/boards/viewtopic.php?f=11&t=831863. They took advantage of the fact he has an incredibly inconsistent outside shot that needs volume attempts to be even bad efficiency wise (39.9 eFG%) by playing a complicated match-up zone resembling the box and one. In addition, James LOVES to roam and collect weakside stats (you can’t roam against shooters/Mullin). He will respond to defensive challenges on ball, but goes under screens constantly and is terrible fighting through contact he doesn’t initiate. #1 in the league in touches at 33.5% Usage rate. Amare Stoudemire: Fantastic athlete. Able to draw bigger defenders away from the rim with his range. Uses his quickness to beat people to the rim and finishes with authority. Poor rebounder for his size (9rpg and only 15.2% boards grabbed). Bad passer. He has 1.7 assists to 2.2 turnovers. His defensive liabilities are well-documented. He is extremely foul prone and is a terrible man to man defender. #1 on the Suns in touches at 28.2% Usage rate. We’ve only discussed four players and Winona has already used 108.2% of his touches. Keep that in mind when you’re looking at these stats. None of these guys will get NEAR the same amount of offensive touches. Amare, at the point in his career we are examining, relies on out-producing his opponents to be effective. He needs touches to do so. How can everyone get their touches when almost every single one of these guys is used to have the MOST touches on their team? The more offense-first guys you have on your team, the less valuable each one becomes. Nate Thurmond: Never backed down from anyone. He couldn’t be intimidated not even by Wilt and Russell. However, his rebounding is overrated in the year picked. 16.6% of available rebounds were grabbed by Thurmond. That is not impressive. He was great defensively in all areas on that side of the ball. That said, he is an offensive liability at only 43 FG%. Contemporary opinions said Nate had a smooth outside shot, San Juan does not feel threatened by 43 FG%. He was 2nd on the Warriors in touches using possession estimates. Considering other offensive options on this team, their need for touches, and his need for volume to be a high scorer, Nate will probably contribute very little offensively for Winona. If his defense contribution is lessened, he becomes far less valuable than what meets the eye because, again, he won't do a lot for Winona offensively (assuming Winona gives touches to more efficient scorers). Manu Ginobili: One of the best ugly games of all time. Completely unorthodox. He is underrated in today’s game and many argue he was the Spurs most important player last year. However, like almost everyone who will receive big minutes on the Winona roster, Ginobili led the Spurs in usage rate at 28.7%. Ginobili’s efficiency goes up with his touches particularly on his 3Pers. He needs volume for rhythm (46 FG%). That, my friends, is why Popovich prefers to bring him in off the bench. This forces him to be the focus of the offense when he enters the game allowing him to warm-up and develop rhythm. Without that rhythm, there is no Manu. Charles Oakley: Tough. Mean. A defender and a rebounder. Oakley is a great vet off the bench. San Juan considers Oakley Winona’s version of Roundfield with a touch more boards, more meanness, and quite a bit less skill on the offensive end. Peja Stojakovic: One of the best pure shooters the game has seen. However, he is the Anti-Clutch, lacks athleticism, and is a revolving door defensively. Peja enhances the potent Winona offense and finally represents a player who doesn’t need the ball, but only worsens a defense that desperately needs help. PF Jack Sikma 36 Backs up C. Hopefully, he can match Amare minute for minute. Unless Amare plays more than 38, he does so. Philosophy: Always have at least two shooters above 36% on 3s. Always have either Sikma or Robinson on the court. Get D-Rob, Billups, and Sidney extra rest by resting them between timeouts and quarters (though not necessarily all at once). Minutes are lower than expected in order to allow the defense to play high energy zones as much as is necessary. 1. Make LeBron work defensively OFF the ball. The Sharks want to take out LeBron's legs for crunch time. If he has to carry the offensive load while constantly being attacked defensively, he may burn out. San Juan feels LeBron is better on ball than off ball defensively. LeBron will not be as effective offensively if he is being rattled on the other side of the ball. 2. Draw Thurmond out of the paint. Thurmond’s tremendous defensive help abilities become limited when he is out of the paint; Winona’s anchor becomes neutralized. Amare now has to protect the rim alone which will only put him in foul trouble even faster. Amare is forced to be the primary rebounder down low. He is a poor rebounder. 3. Make Amare work defensively ON the ball. Amare is already foul prone enough (4.0PF per 36 minutes) but putting him on an island in the low post? Foul trouble. More importantly, he just isn’t that good defensively and will give up easy points. Amare is the Warrior’s only post scorer that can do serious damage. If he gets in foul trouble, they become a completely perimeter-oriented jump-shooting team. 4. Commitment to the horses: give David Robinson and Chauncey Billups touches in their sweet spots. When Bobby Jones comes in the game at PF for 5 minutes, the offense becomes the Billups show because Bobby can play on the perimeter opening room for Chauncey in the high post. He will isolate in triangle pinch post action and do his worst to Williams or McMillan. Even though there is great focus on attacking Amare and LeBron as much as possible, D-Rob is the cog that makes everything run smoothly. Whether he is up top passing or being the #1 option in an Attack Amare type set, he will always get touches. That said, the Sharks will go to D-Rob on the mid-block (through UCLA and/or Tri), regardless of who is defending him, for 2-4 consecutive offensive possessions 2-3 times during the course of a game. 5. Slower, more methodical pace. Only 5% transition offense to keep the defense honest. The triangle and the UCLA offense are half-court sets that will slow the game down and force Winona to think the game at San Juan’s pace rather than run it at theirs. 1. Stop LeBron James with a total team effort using a box and one zone. The best way to stop LeBron James? The Box and One. With James (31.5% 3P) and Harper (25.0 3P%), Winona will struggle against the zone. Defenders will dare LeBron and Harper to beat us from the outside by sagging off at the wings to play the passing lanes while Moncrief, the one, pressures Williams. This disruption keeps the ball out of the high post at a greater rate (allowing our wings to bother Amare in the high post who is a poor passer 1.7 AST:TO ratio), makes a wing entry to LeBron even harder, and also takes even more time off the clock. The key to beating zone defense is ball movement and outside shooting. Making smart, clean passes takes time. Time is something Winona is short on because of Moncrief. Will LeBron settle for jumpers? Will Winona be able to get good scoring position for their players with enough time on the clock to work with? Boston answered the first question (James: 26.7ppg, .355 FG% 07-08) and Sid spent a career answering the second. If you believe history, you should be compelled to answer in the same way. 2. Shut down the fast break. Robinson is a superior rebounder to Amare. Remember, he grabbed 16.2% of the boards available next to RODMAN (18.4% and 20.8% the following two years after Dennis left). Amare grabs 15.2%. Thurmond grabbed 16.6% of boards in 71-72. Sikma led the league in defensive rebounding in 81-82 and grabbed 18.5% of boards available. D-Rob will dominate the boards, Sikma will out-rebound Thurmond (more weight, better rebounder in the years chosen). No boards, no break. Because Billups plays up high in most all of San Juan's sets, he has the best chance to get back on defense ahead of any offensive player. As such, he will not attempt to go for boards, but, instead, getting back on D will be his first priority. As for the others, San Juan will always attempt to send in 3-4 players for offensive boards. 3. Pressure the primary ball-handler. Moncrief checks the primary ball-handler. How can Winona play offense with only 15 seconds on the clock each time the offense is finally set up? Not only that, but then the “Quarterback” has to create passing angles against Sid. The key to defense is DISRUPTION. Defenses must DISRUPT the offense and what they are trying to do. No one is a greater disruptive force on the ball than Sidney Moncrief. 4. Force poor outside shooters into jump shots. When playing man to man, or even zone, San Juan defenders are instructed to sag off of poor outside shooters while taking a wide defensive stance to influence penetration baseline. Harper .250 3P%, James .315 3P% (39.9 eFG% on jumpers total), and Thurmond .43 FG%; San Juan welcomes them to shoot from outside. 5. Neutralize Stoudemire and his athleticism. Chauncey initiates Power O. Mullin and Moncrief fake UCLA action (by quickly darting in front like they are looking for an entry) and then streak back door. If either defender is completely lost (particularly Harper against Sidney’s speed), Chauncey looks to throw an oop. Moncrief sets a screen on LeBron in the middle of the court near the front of the rim. bb. If LeBron goes over (between the ball and Mullin), Mullin stops and cuts back around and goes off D-Rob’s hip who sets a second screen for Mullin. Mullin looks to catch from and shoot from 3 (strongside wing) as Chauncey makes the pass. If LeBron gets close enough to get a hand in his face, Mullin pump fakes and goes for a one dribble pull-up mid-range jumper from 19-21ft. bc. If LeBron goes under (between Mullin and the hoop), Mullin continues his cut and comes off of a downscreen set by Sikma looking to catch and shoot from 3 on the weakside wing. If LeBron recovers enough to get a hand in the face, Mullin pump fakes and goes for a one dribble pull-up mid-range jumper from 19-21 feet. bd. If LeBron and Harper switch, they still have to run off of the down screens set by the bigs. If they recover from these downscreens, Chauncey enters the ball to Moncrief who has the entire weakside of the court to take James one on one. With big men drawn up high, LeBron has no help against an incredibly fast slasher. be. If Winona switches on any of the down screens set by our bigs, Chauncey can look for either wing isolated against a C or a PF, but, preferably, the wings, upon receiving Chauncey’s entry, will throw the ball into the post where Sikma or D-Rob has James/Harper isolated. bf. Remember, at all times, the same action being run for Mullin is being run on the opposite side of the court for Moncrief (minus the screen set by Moncrief obviously). The only differences between Moncrief stops his cut at 18-20ft looking for catch and shoot in the mid-range and if the defense recovers to get a hand in the face, Moncrief pump fakes and attacks the rim viciously using his athleticism and slashing skills. Both Amare and Thurmond are out of the paint. To help, they’d need to leave one of the bigs at the elbow. Moncrief finds the big that was left for an open 15 foot jumper if they do so. bg. If at anytime the Winona big men cheat out toward the wings, Chauncey can feed the big men right down the pipe for an easy inside shot. bh. 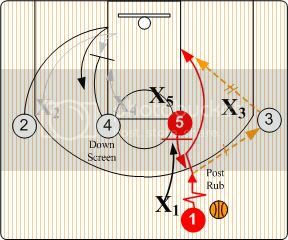 If at anytime the Winona wings cheat anticipating the baseline screens, San Juan wings can fake the cross action they have and cut back out to their original wing positions for open Js (Moncrief 20ft, Mullin 3pt line). If the defense stops all screen action (unlikely considering LeBron is bad defending this type of action and Moncrief is way faster than all SGs on Winona’s roster which allows him beat them around screens and on cuts) then Chauncey has the option to attack Deron Williams one on one top of the arch with no help nearby (both bigs on the blocks now). If he gains an advantage, he goes to his mid-range game to avoid shot blocking. If the defense stops screen action and Chauncey iso then Chauncey has the option of feeding the big man who is being defended by Amare Stoudemire. The other big man should rise to the elbow making it harder to double. If all of this action is denied, stopped, or looking sloppy at any point, Chauncey can immediately initiate triangle continuity. Note: Mullin will occasionally set the screen on Harper to help keep the defense honest. Chauncey tries to make wing entry. If the defense denies, Mullin goes backdoor. D-Rob steps out. Chauncey hits D-Rob and Robinson has the angle to find Mullin going backdoor. If Chauncey successfully makes the wing entry, he takes Williams off D-Rob’s hip and heads to the basket. If he has a step, Mullin feeds him for a lay-up. If James cheats down to help, Mullin pops a three. If Chauncey doesn’t have the step, Mullin can look to feed Chauncey for one on one post versus Williams on the block. If Chauncey is denied low block position or that option is undesirable, D-Rob steps out from the elbow to 18-20feet. Mullin, immediately after hitting D-Rob on the step out, files down and sets a screen on the low block for Chauncey who cuts off him looking for a feed from D-Rob on the catch and shoot 3.
eb. If the defense switches the Mullin screen, D-Rob looks to exploit Mullin on the block versus Williams or Chauncey isolated against the wing. D-Rob can also look for Moncrief, who is much faster than Harper, coming off of a Sikma down screen into the top of the key for a money mid-range J on the weakside. If Moncrief and Billups are denied, Moncrief pops out to weakside wing. D-Rob hits him and Moncrief looks to enter the ball into Sikma on the low block against Amare. This is the primary option of this offense if the easy opportunities it creates all fail. gb. If Moncrief and Billups are denied, D-Rob can also look to initiate triangle continuity by making the entry to Chauncey at the wing and falling to the mid-block while Moncrief steps out to the weakside wing and Sikma rotates more towards the baseline. Note: We will occasionally run this on the opposite side of D-Rob to keep the defense honest and make Power O faking action more potent. While attacking Amare is a huge goal for San Juan, D-Rob needs touches to and he will get them even if it means going at Thurmond occasionally. Chauncey calls the offense to go straight into the triangle. Sikma moves down and out along the baseline. D-Rob moves down mid-block. Chauncey dribbles clears the wing as Mullin falls down to the corner. San Juan wants PGs facilitating instead of the wing. Chauncey, an excellent entry passer, feeds D-Rob mid-block. D-Rob faces up and goes to work one on one. If the defense doubles D-Rob, Mullin is in the corner, Chauncey is strongside wing, Moncrief flashes from the weakside wing to the weakside elbow looking for catch and shoot in the mid-range, and Sikma rolls to hoop on the weakside looking for the wrap-around or dump off. Chauncey can also look to the weakside for Moncrief/Sikma two man game. D-Rob sets a screen on the high post. If the defense switches, ball is reversed to Moncrief who makes high post entry to D-Rob. D-Rob faces up and works on Amare one on one at the elbow. If defense doesn't switch, Sikma heads to low block with a head start on Amare for position. Chauncey feeds him immediately. Sikma goes to work on Amare with his back to the basket. This is option #1. If the defense looks to double Sikma in the post, Chauncey spots up strong side wing, Mullin spots up in the strong side corner, Moncrief cuts to the weakside of the top of the key (18 feet), and D-Rob rolls to the hoop. Perfect spacing. Sikma kicks out to any one of the shooters or dumps off to D-Rob. cb. If defense doesn't switch, Thurmond is out of the paint. Chauncey can look to run solocut triangle action. This dumps Mullin into the opposite (weakside) corner. From here, Chauncey and Sikma can run wing PnR action against Williams/Amare. cc. If defense doesn't switch, Thurmond is out of the paint. Chauncey can look to reverse the ball to Moncrief weakside wing for the two game. Moncrief, the slasher, has a clear path to the basket running the PnR with D-Rob. Even with zone rules, defenders must guard a man, not just the hoop, or it is a technical foul. Slice helps destroy zones by highlighting the abilities of three-point shooters forcing defenses to step out and guard them. 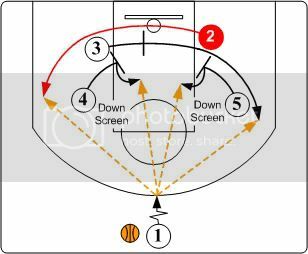 Slice overloads the zone on the weakside and runs continuous cuts through holes in the zone that are created by the defense respecting shooters. Simply put, zone doesn’t work without defenders who know how to help without helping too much and it doesn’t work against teams with a roster full of outside shooters and strong passers. If Winona runs zone, call him on it; it is NOT a good plan against a team that has players with a jumper at every single position. Chauncey looks to make high post entry to either big man who will step out to 18-20feet (whoever is less focused on by zone because one guard has to guard Chauncey leaving only one guard able to front the post). It will probably be D-Rob because he’s a better player and I’ll use his name because of that, but take NOTE that it could either big man. If there is only one defender at the top of the zone then the entry is easily made to D-Rob. Note: One guard front against a two high post offense is destined to fail right away because a zone starts breaking down as soon as you get inside; Chauncey gets it inside immediately, everytime, without any work to one of the high posts against a one guard front. bb. If the post fronts 18 feet away from the hoop, he is not only an idiot but he will give up an easy lay-up down the middle to Sikma with no one else back there to protect the rim. bc. If the top of the zone guards play the bigs too close and ignore Chauncey, Chauncey will rain 3s from the top of the arch at .433 3P%. Immediately after the entry Chauncey cuts to the weakside corner while D-Rob slice cuts into the lane trying to exploit a hole in the zone where the post just stepped out to defend Billups in the corner. (David will finish his cut on the opposite side of the lane he started behind the zone or on the block). cb. If the PF or C who is guarding Sikma cheats to help deny the pass then Sikma has the option to step up and take an uncontested zone busting 16-17 footer. cc. If the baseline defender does not step out to defend Chauncey (thus creating the hole for the post who is slice cutting), Sikma hits Chauncey in the corner for an easy zone busting three. cd. Mullin rotates up higher along the arch. If the defense doesn’t step out to defend him, Sikma hits Mullin at the wing for an easy zone busting three. cg. If no one helps, the slice cut results in a lay-up. If the first slice cut doesn’t work, Sikma reverses to Mullin at the wing and immediately slice cuts looking to exploit the fact that one of the defenders at the top just stepped up to defend Mullin and another big along the baseline is defending Chauncey in the corner (he’ll finish his slice cut at the opposite block which is on the weakside). D-Rob who has been waiting behind the zone / on the strongside block curls to the mid-block. db. If the baseline defender does not stay true to Billups and helps on the slice cut then Mullin sends the ball Chauncey’s way for a zone busting corner three (most likely scenario). If the defender then steps back out to help on Chauncey, Chauncey can feed Sikma under the hoop. db. If the post defender who has been tending to D-Rob cheats across the lane to help then Mullin skips the ball to D-Rob for a 10-12 footer. If the opposite wing zone defender is cheating to deny that passing lane, Mullin reverses to Sid who steps up for a 20 footer. The wing defender who was cheating may recover in which case Sid quickly whips inside to D-Rob for a J or a quick off-the-bounce attack. dc. If Mullin’s man cheats down to help on the slice cut, Mullin pops a zone busting three. dd. If no one helps, the slice cut results in a lay-up. If for some reason it doesn’t work or Mullin can’t find the angle on the slice cut (HIGHLY unlikely) then Sikma steps out to the baseline and D-Rob flashes into the lane just below the FT line (both on the weakside). Mullin makes the entry to Chauncey in the corner/low wing. Mullin cuts to the top of the arch. eb. Chauncey has the option of feeding Sikma in the short corner or D-Rob flashing in the lane just below the FT line. Depending on what kind of zone it is, either D-Rob or Sikma will have a SF on them. For example, if Winona plays Amoeba, Sikma has the small forward on him in the short corner and if he plays box and one, triangle and two, or 2-3, it will be D-Rob with an SF guarding him at the elbow. At this point, the big men have the option to just take a jumper right over the top of the smaller defender who is powerless to block the attempt. ec. The offense can also continue more high/low zone attack action with continued slice cuts over and over until the defense makes a mistake. If the clock is winding down, one big man stations himself at the elbow and the other on the block (same side of the court). The wing reads who has the SF on him, makes the entry, and the big man shoots over the smaller defender. NOTE: Remember, zone only works when teams don’t make their jumpers! When they do, the team MUST get out of the zone! The triangle works against any zone because it floods the strong side with three players. In order for the defense to play anything except a zone that looks and acts like man D, they have to send a 4th player to the strongside. In the triangle, the masterful spacing allows for very quick reversal passes to the weakside wing. The ball moves faster than feet and thus the triangle moves faster than the zone. As long as a team has the sharp shooters and the basketball IQ to make it work, zones are shredded. If the defense doesn't send the 4th guy the offense is EXACTLY the same against the zone (refer to above for how San Juan executes the triangle against man). The same D-Rob screen on the high post occurs, the same shooter flight patterns are in place, etc. If the defense sends the 4th guy... Remember, in order to deny the pass to D-Rob they have to front him or send a 4th defender to give help. In the case of a front, seal and lob. In the case of a fourth defender, the ball is quickly reversed to Moncrief. The lone defender must choose between Moncrief and Sikma who is on the baseline. If he chooses Moncrief, Sid swings to Sikma rolling to the hoop for an easy lay-up. If D-Rob’s man rotates over to help, Sikma dumps off to D-Rob for a dunk. If he chooses Sikma, Sid steps up for either an uncontested 20 footer or a lightly contested 16-18 footer. San Juan runs the box and one. To force the ball out of James’ hands, create a little pressure, and keep the offense on its toes, James will be trapped 10-15% of the time as the diagram in the “Sets” section showed. Note: When James does get into the lane, zone or otherwise, San Juan wants the WINGS, not the bigs, to hack him. He is a low 70% FT shooter and San Juan has plenty of depth at the wings. He is going to be pressured all the way by Sid. It will simply be too much to ask for LeBron to take the ball-up, set up the offense, pass it, get it back, and then do something with it against the box and one. The best way to beat James is to overload his plate; make him do too much. If Winona resorts to this, the James battle is won. Against the PnR, San Juan will FLASH and recover instead of a hard show. San Juan believes Amare is too quick to leave for long even when the super athletic D-Rob is the one recovering to him. San Juan does not want to see Amare, under any circumstances, catching the ball on the move to the hoop. He is deadly when he plays this action and it cannot be allowed (thus a quick flash over hard show). Moncrief does an excellent job of anticipating screens and will make life incredibly tough for Deron Williams. Moncrief has the speed to catch Williams if necessary. San Juan will show HARD on the PnR allowing great, athletic defenders in Roundfield and D-Rob to showcase their recovery speed. To keep the offense honest, Deron will be trapped about 10% of the time. The defensive big who normally flashes will step out hard to engage the trap with Moncrief. The other defensive big will rotate to Winona’s post who is rolling to the hoop. Billups/Mullin will then rotate down onto the man left by San Juan’s big helping on the roll. If Williams is able to pass out of the trap, it will be to James or Harper sitting at the 3 point line. San Juan is willing to live with the consequences of either shooting a 3. Bobby Jones is brought into the game and the defense goes man to man. When Mullin and James are out of the game, San Juan believes there is no player on the court who requires help/double team. Considering EVERYONE off San Juan’s bench in this game is a great defender with All-Defensive team selections in their year, man up is a very realistic, effective defense. San Juan will make a specific effort to funnel penetration baseline playing slightly wide. Former DPOY David Robinson is at his best defensively in this type of situation. He will block 3-5 shots and change countless others. Any time Thurmond plays up high or outside, he will be ignored or doubled off of. At 43 FG%, he is a liability. Sikma was elected to the 2nd All-Defensive team in 81-82, led the league in DRtg, and it wasn’t because of his blocks (1.6). Sikma is there for his man defense. If Thurmonds 16.6 rebounds are less than Sikma’s 12.7 after pace adjustments then what does his 21.4 points per game go down to? Either way, 43 FG% is a liability and he doesn’t have an easy task trying to score on Sikma. In addition, this allows San Juan to double Amare with a second big and reap the benefits of a 1.7 assist to 2.2 TO ratio. San Juan will respond with a triangle and two zone. In this manner, Sidney still gets pressure duties on Williams. Bowen or Jones will be brought into the game to play the other non-triangle member. Billups/Buckner will play the top of the triangle and Sikma/D-Rob/Roundfield will play low on each block. With Moncrief on Williams, and Bowen/Jones individually trying to deny the ball to James, Winona will have very little, if any, time on the clock when James finally receives the ball. Once he does, James still has to beat Bowen, a rotating Mullin, AND finish over/around D-Rob and Sikma. That... or take jumper after jumper until he cools himself off (which is what he did against Boston in the year he is chosen). San Juan will return to man defense rotating Bowen and Bobby Jones on him throughout stretches. Bobby and Bowen will work hard to deny the ball while Moncrief pressures Williams. If James does receive the ball, both will play him for the outside shot while playing wide to funnel penetration to Sikma/D-Rob. San Juan’s efforts to attack James on offense will increase as well. San Juan wants to keep the ball out of his hands in this situation, take out his legs, and try to frustrate him thus taking him out of his “zone” or “rhythm”. The Sharks have four NBA Champions and a true competitor in Moncrief, on the court, in the crunch. This group of 5 is excellent both ways and can get that one critical stop that defines the game. San Juan has maximized the rest of D-Rob and Sikma by sandwiching their breaks between quarters and timeouts. In addition, D-Rob will get a rest about the 8 minute mark of the 4th quarter until the 5 minute mark ensuring he is ready to anchor and carry San Juan the last few steps if necessary. D-Rob and Sikma are playing their season averages (minutes wise), but can play less if Amare plays less or is in foul trouble. If Amare plays more than 34mpg, he's above season averages. San Juan has the legs advantage with its bigs playing their regular minutes and Stoudemire playing more than he is used to (if he avoids foul trouble). San Juan has the legs advantage on the wings after James has been running through screens all-night while Bowen has played sparring minutes and Moncrief has played below season averages. Finally, and of great importance, Chauncey “Big Shot” Billups aka Mr. Former Finals MVP should have an important edge over young buck Deron Williams. 1a. Power O to attack a, hopefully, tired James. The onslaught cannot stop now. James will try to shoulder the load in the clutch and the Sharks cannot afford to give him a breather on the other end of the court. If Power O fails, Chauncey has isolation at the top of the key versus Williams. San Juan likes the prospects of a Finals MVP going at 3rd year Deron Williams. 1b. Attack Amare using UCLA O and the Triangle. At this point, San Juan anticipates Amare may be sitting on that 5th foul trying everything he can to stay in the game. This is an opportune moment to press down on the gas pedal and go for his throat. Whether it is D-Rob or Sikma, attack Amare on the ball. 2. D-Rob iso against Thurmond. If the offense is stalling, Chauncey will direct the team to go straight into the triangle where D-Rob will get the ball mid-block and face up. At this point, San Juan wants to ride their prized, primed horse to the finish. If no can create a shot, D-Rob, at 28ppg, is the man to go to. 3. Using the UCLA O, San Juan can post up Chauncey on the block if Thurmond gets a stop or two against D-Rob. Chauncey is big, strong, and talented in the post (watch his passing: http://www.metacafe.com/watch/yt-nvzHhEP4YSU/chauncey_billups_makes_the_around_the_back_pass_in_the_post/). Some might say he is at his best in this scenario. In any case, Billups has the low block and the entire baseline area to work with against Williams because the big men are drawn up out on the FT line defending capable shooters in D-Rob and Sikma. If Winona bigs help down, Chauncey will find Sikma or D-Rob for the elbow jumper. Pure man to man. No gimmicks. The Sharks have a first or second All-D team defender at every position. Chauncey's D gets better in the clutch. He allowed PGs, in 2005-2006 (his year), 9.4 PER and 44.9 eFG% shooting in the playoffs. Match-ups: Moncrief on Williams, Chauncey on Ginobili/Harper, Bowen on James, Robinson on Amare, and Sikma on Thurmond. Same man to man defensive strategies apply. If Winona refuses to put shooters on the floor, the Sharks will sag off and force the shot. San Juan will play in a wide man to man influencing penetration baseline into D-Rob. Again, the boards are pounded with Thurmond out of the paint. The Sharks continue to exploit Amare’s weak rebounding ability to make sure it is ALWAYS ONE and DONE. 1. If Winona uses off-ball big on big screens to get Amare versus Sikma (by attempting to force San Juan to switch), the Sharks will not do so. Taking full-advantage of Robinson's insane athleticism and great length, Rob will help deny the passing lane for a moment allowing Sikma to recover. This will give Thurmond a brief opening to shoot (if he receives the ball). Considering he shot 43 FG% and Sikma is recovering to contest, San Juan will take its chances on a Thurmond jumper rather than an Amare versus Sikma isolation. D-Rob in foul trouble. Sikma plays more minutes at C. Raef can see minutes where he will play the same role as Bobby Jones offensively. Roundfield takes new-found PF minutes. More emphasis on Chauncey/Mullin in the Power O and UCLA. Chauncey in foul trouble. This is why Buckner was added. A drop-off in O, but an improvement defensively. More emphasis on D-Rob/Sikma down low. Foul trouble on the wings. With Bowen, Houston (can play a similar role to Mullin in Power O if necessary), and Jones off the bench, the Sharks have, literally, all types of wings available should they need a specific skill set: shooting, size/rebounding, or great man to man defense. Winona relies too much on the defensive brilliance of Thurmond. Out of their starting line-up, Thurmond is the only player with All-Defensive selections. While Harper (debatable in his Cav. years) and Williams are solid defenders, remember, one of the criteria is dominance. Solid isn't dominant. You can be solid against NBA talent, but that doesn't make you solid against some of the greatest NBA talents ever. How will Winona score in the post if Amare is in foul trouble? How will Winona prevent Amare from getting in foul trouble when San Juan’s plan calls for mercilessly attacking him on an island? By attacking Amare constantly, San Juan significantly lessens the impact of the second best option on the floor for Winona. San Juan believes that it has generated the best possible method of defense AND attack against LeBron James that the Shark roster is capable of executing. James' paint opportunities are limited, he is influenced to shoot jumpers (which he likes to do: 5+ 3PA per game), he has to work off-ball the entire game defending shooters (that means no roaming), and with Amare likely in foul trouble, James has to shoulder more of the offensive load. Does he have the legs to do this and still be the hero in the last 5 minutes? Will it limit his effectiveness in the process? San Juan believes it most certainly will. Because of the Sharks superior rebounding and transition defense emphasis, San Juan believes that a huge part of Winona's offense has been contained and limited (fast break). The Suns traded for Shaq because Amare and co. weren't effective enough when the game slowed down to a half-court crawl in the playoffs. The Cavaliers may be a great defensive squad, but their offense is terrible in the half-court. They wanted Jason Kidd to help speed things up. The Sharks think their defensive efforts will be too much to overcome with Williams being neutralized, or worse, by Moncrief, Amare giving up as much as he gets against D-Rob/Sikma, and LeBron facing a defense he is proven to struggle against (26.7ppg, .355 FG%). After all, the Sharks are no slouches offensively. San Juan has superior depth. Both teams have an All-NBA second teamer coming off the bench. Both teams have two All-Stars. The difference? The Sharks have 4 players with All-Defensive selections in the second unit. Winona has one. San Juan has six champions as MAJOR parts of the rotation. Winona has two (possibly three, but it is unlikely Dawkins gets big burn with Thurmond capable of 40+ MPG). San Juan has superior floor balance. The Sharks have little to no offensive liabilities and there are certainly none in the starting line-up. The only player who doesn’t have a fantastic 3-ball has a fantastic mid-range game (Moncrief). Winona, however, has an offensive liability at C, poor outside shooting in the starting line-up, and a general lack of defense at multiple positions. There is no doubt Winona has an athletic, YOUTHFUL team. For some, that may be favorable. The Sharks prefer veteran grit, which they possess. The Sharks prefer four champions in the crunch time line-up to just one for Winona. The Sharks prefer six champions as active members of the rotation compared to three. Can Winona's young guns come up big when it counts most? Who knows? You don't have to ask that question when it comes the Sharks. They've already done it. Sad to say it, but see LA vs Boston 07-08: Defense and veteran grit win rings not youth and offense. Note: Manu gets bulk of the minutes, but comes off the bench to keep his comfort level as sixth man. Harp will play 8 min at the start of the 1st and 4 min to begin the 2nd half. Rest of the time: Manu or LBJ at 2. Minutes are rough estimates only, to give indication of how often each player will be used. I admit, San Juan has an excellent defensive lineup. They’re not made to run, though. My entire team, outside of Thurmond and Oakley, can. Not only that, I’ve got multiple players who can run the break and do it well, while not worrying about tiring anyone out. Immediately after every rebound/inbound, the ball will be pushed hard, Suns-style. Even if SJ manages to catch up, it’ll likely create mismatches. When forced to play half-court, the ball’s going into LBJ, period. Mullin is a total mismatch waiting to happen. Assuming Sikma or Snuggles come over to help, considering neither guard is strong nor tall enough to matter, Amare’s one of the best PFs ever at making dashes to the hoop for easy dump offs, while Nate will be waiting 12-15 ft. away from the hoop for a jumper or to keep the ball moving around the perimeter to the open man. Once Manu and/or Peja come in, that adds another 3pt threat to keep the offense open. SJ is also very, very thin up front. Early in the 1st, plenty of time will be spent banging on Sikma and Snuggles in hopes of getting a couple quickies on them. Amare facing up on Sikma will be an advantage for Stoudemire; Sikma was solid on D, but he can’t handle Amare’s explosiveness. Not even KG or Duncan can (check the head-to-head #s). Fouls or double teams, either way, advantage: Winona. As good as SJ is on D, they don’t have many offensive options. Snuggles is the main cog, and Thurmond can handle him w/o double teams – they have very similar bodies; both are lean and agile, yet strong. The D will stick to man-to-man, no doubling. LBJ stays home on Mullin while showing the Dream Teamer strength and athleticism he never had to face in his prime. LBJ’s D improved a lot in the past year, which, combined with his quickness and the combo of Nate/Amare behind him, should be enough to quell that threat. Billups won’t be able to bully Deron (or any of his backups) in the post, taking away half his game. He’s a solid passer, but not elite; Deron will play up on him to take away the open jumper early. Once the 4th rolls around, he’ll back off and make Billups earn his pts from outside w/o the chance to get into a rhythm. Moncrief will be the opposite; he honed his jumper as time went on, but still preferred driving to the hoop. Any double teams will come from Amare, but not until just before either Snuggles makes his move or the guards commit to the paint on a cut. With a lead, the lineup will be Deron/Manu/LBJ/Oakley/Thurmond. If behind w/ less than two minutes left, Deron/Manu/Peja/LBJ/Amare, and LBJ’s running Sikma off the court until SJ makes a lineup change. Deron, Manu, and LBJ all have clutch histories, and while Peja gets crap for not being clutch, his 3pt shot is still deadly as all hell, and must be respected. This way, either Bowen (I assume he’ll be closing if they’re leading) or Mullin can’t guard LBJ, or it leaves a huge mismatch on someone else. With a lead, both Thurmond and Oak can hold their own inside. Chauncey’s got the best clutch rep on their team, but it’s not deserved, outside of one playoff series (including a fluke half-court shot). Aside from him, Snuggles is the only one w/ rings, and those didn’t come until he was a second option. Manu gets stuck on Chauncey, not giving him any room to shoot. Deron stays with Moncrief, using all the Sloan-taught tricks to slow him up and keep him from cutting to the hoop. LBJ stays a couple feet from Bowen/Mullin, only getting close if the ball comes on that half of the court, letting him clog the passing lanes inside a bit more. If it’s dumped into Snuggles, Thurmond stays with him 1-on-1. Quick buckets are scored off cuts and passes to open shooters, not post moves vs. one of the best all-time defenders at center. Only exception – final shot, when Oak/Amare would double hard off Sikma, with the rest of the defenders switching on that side of the court to cover open shots w/o possible repercussions of mismatches. In all likelihood, Bowen will be used to slow down LBJ. Any burn Bowen gets kills their offense. So be it; if that happens, more touches for Amare and Thurmond, which means more pressure for them to stay out of foul trouble. Once that happens, LBJ can move to PF, leading to huge mismatches and/or awkward lineups for SJ. Besides, Bowen wasn’t alone in defending LBJ – he was doubled and tripled on many occasions in that series because his teammates were inept offensively; not the case here. So please, leave Bowen on LBJ one-on-one. He’s an inch taller and 15 lbs stronger now than he was in the Finals. If Amare gets in foul trouble, in comes Chocolate Thunder; continue running. If Nate gets in trouble, Amare moves to center, and Outlaw gets some burn, since he’s quick enough to help double Snuggles while still getting back to Sikma on a dump pass. If LBJ gets in trouble, Peja gets more burn; he can bother Mullin w/ his height, or be hidden on Bowen on D if he’s in the game. Simple. LBJ’s the best player, big or small, in this matchup. Not only that, San Juan’s frontcourt depth is horrible once you get past DRob and Sikma. Foul trouble or fatigue for either of them means major mismatches. And once the game comes down to the 4th quarter, half my lineup is made for clutch moments; San Juan’s, notsomuch kthx. LBJ gets whatever shot he wants with his size; Chauncey needs help. If the effort from San Juan matches the time put in by the coach, they'll be a scrappy bunch. Is there really much that needs to be said, that hasn't? San Juan has covered a lot of bases and will try a number of things against LBJ. They need to with Mullin starting against him. San Juan has put contemplated a variety of defensive options to deal with LBJ. Defensively between these two teams...when it gets down to it, it may just be who gets scored on a little less at a couple key positions. Both teams have good closers that will be tough to deal with. This team is about LeBron. Sure, there are a lot of good scorers and some guys who won't get as many touches as they need, but the King will get his. And Mullin is a soft spot on the D end. Defensively, I worry about Amare against a crafty guy like Sikma who is no slouch on the boards. Amare gives up boards to bad rebounders, Sikma isn't one of them. LBJ will be made to work on the D end, a solid defender...but he's prone to giving up easy scores. He'll be chasing shooters around most of the night. The box and one sometimes looks like the box and none with Mullin out there on LBJ. Although LeBron is already looking at the second and third defenders before making a move, his power and first step overwhelm Mullin. He's able to get early penetration and foul trouble on helping wing defenders. He goes to the freethrow line several times during the first quarter. This has slowed the pace of the game down. This allows James to rest a bit despite doing some of the heavy lifting that San Juan wanted. Winona goes up by 5 early on. Moncrief is giving Williams some problems defensively. When LeBron sits, the offense stagnates a bit as San Juan has switched to man to man D effectively. Winona is pulled back in from their early lead. As bad as Mullin is on LBJ, Amare is getting killed. Sikma is not only getting what he wants, but keeping Amare off the glass. Sikma scores a putback layup off a Billups missed jumper that pulls the teams even. When James returns, San Juan switches to the Triangle and Two with Bowen/Jones playing ball denial D. This change has Winona settle for jumpers on a few possessions before they are able to exploit it with a series of scores by Manu somehow getting to his left after LBJ hits him in the middle of the lane on a couple cuts. Robinson has been steady and consistent and has stayed out of foul trouble. Winona ends the half up by 3. The third starts out with LBJ schooling Mullin in the box and none again. Winona pulls up by 7 at one point. Billups reels them back in with a timely three. Sikma, again, seems to get whatever he wants against Amare. They tie it up, forcing a timeout. Late in the game, San Juan has settled on man D with Bowen on James. Although, they miss Mullin's deadeye, Bowen is no slouch from those corners. This proves to be their best match up. LeBron still comes up with with a couple of drives, including a poster job on the Admiral trying to come over for the block. On the other end, Winona forces a couple of misses, but Amare gets burned by Sikma on the glass on back-to-back possessions for easy putbacks. Those are killer and San Juan pulls out to a 6-point lead. LeBron is not giving up, however, and hits a three from the left wing. Although, you've had a nice strong guard match up at times (despite the switches) Billups comes up big down the stretch with a couple of key jumpers. He refuses to lose and maintains the lead in teh final minute. When the pressure is on and the score was close, he kept a level head and finished the game like a true closer on the road. LeBron grumbles to himself as he heads to the locker room to wonder why an old-schooler like Sikma looked so damn effective against Amare. L4L has taken the Chimpy Hollinger path of paint by the numbers. Many of the stats are persuasive, others are a house of cards that collapse with context. As an example of the latter we get the assertion that Sikma will outrebound Thurmond based on % of rebounds acquired. Thurmond had Clyde Lee at 14.5 rpg and three others over 5 while Sikma had no teammate over 6.3. Switch teammates and roles for Thurmond and Sikma and what happens to Sikma’s superior rebound %? Leave that applesauce to Chimpy L4L, take your own road. Hats off for the incredible effort you put in. San Juan is the three little pigs busily building houses, Winona is the big bad wolf, now we see if any houses are left standing at the end of this game. Plan calls for making LeBron work, attacking Amare and Harper man up and drawing Thurmond out. The 1-4 power options lead to Mullin taking 3's in catch and shoot and Moncrief midrange/finish with DRob as a passer. Mentions getting it to DRob, but per the game plan he is only used as a shooter if Winona switches or stops screen action. They don’t. 1-4 UCLA high post is designed to set up the perimeter scorers with Robinson as a passer. Mentions the play will “occasionally” be flipped to get Robinson touches, will take that literally. Game plans are about choices and that has been made based on the if/thens – Mullin #1, Moncrief #2, Billups and Robinson a distant 3rd and 4th option. The San Juan game plan correctly points out that Ron Harper’s defense in the year chosen is not what it would later become in Chicago. But then it tries to give Harp the same speed he had in Chicago, namely none. “If either defender is completely lost (particularly Harper against Sidney’s speed)”. “D-Rob can also look for Moncrief, who is much faster than Harper.” Concerning Harper you warned that, “Remember, the year picked matters.” Yes it does. 88-89. PRE knee injury. Harper in that year was faster than Squid ‘83. It’s hard to picture Ron Harper as a high wire act but back then he was. Plan to run a la Suns. Have speed edge at 2-4. But there’s a lot of perimeter shots and long rebounds, Amare is quicker, Sikma is better at understanding angles and tougher. Thurmond should beat Robinson to boards, but with this many jumpers being taken no one can consistently control the glass. Curious thing with the Winona game plan. Soy picked new school rules but plays man D and allows San Juan to zone Bron. San Juan jumps to an early lead with hot shooting from Mullin. Moncrief clanks midrange and starts to drive on Harper, Amare tries to help but fouls and sits. Per emergency plans Dawkins comes in and San Juan starts owning the glass. Winona’s running is shut down. In a slower game Winona turns to LeBron. San Juan runs the box and one, sinking back to prevent penetration and conceding jumpers. James drives into the teeth of the zone with no intent but to draw fouls and he parades to the line in volume that would embarrass DWhistle. Per the San Juan game plan the fouls are from the wings to protect the bigs and Mullin and Moncrief pile up the fouls in the first half. Bowen takes the LeBron assignment and now James is forced to pass out as Winona looks to run, use Harper and Amare, but San Juan is more consistent. San Juan has one of the best man defenders ever in Moncrief, but the game plan specifically keeps him away from James. The plan to use Moncrief to force Winona to run 24 doesn't mesh with an offensive game plan with a lot of jump shooting. The long rebounds mean less distance and time to the half court and disrupted spacing. Squid stays on Doughboy throughout, yet Moncrief hacks James in penetration per the box and one strategy vs. LBJ. In the second half Mullin and Moncrief pick up early fouls on James and sit. San Juan brings in great defenders in Bowen and Jones. The Bron milk truck blows a flat, his free throw parade is over. But so is the San Juan offense, which is now sitting on the bench. The Sharks lengthy if/thens don’t account for changes due to foul trouble so it’s more of power and UCLA focused heavily on 2 and 3. But now the 2 and 3 are Bowen and Jones, both are streak shooters and the game turns to Winona with more consistent scoring, Warriors up 6. At long lonng lonnnnng last Robinson and Billups become the primary options for San Juan and they cut it to 2 with 5 left. LeBron’s legs are tiring from all the penetration, but he always has something left to close. San Juan hopes to attack Amare here but a very fresh Oakley is in. Mullin is fresh from the foul trouble but L4L goes with Bowen to close. The 3's don't fall and he defers. Moncrief is rested due to the foul trouble and he starts hitting some shots. Winona turns to James to close. San Juan has Moncrief but he’s still on Deron Williams. James uses his speed to get a step on Bowen, draws the D to set up Manu, who has Chauncey on him. Ginobili is money late even with a hand in his face and buries it. James and Ginobili vs. Billups and Moncrief to close. Winona wins that matchup and the game in a very tight one. Winona wins and advances to the 2nd round to play Barcelona. As the higher seed the game is played in Barca and Aabs calls the same rules. I had a ton of fun doing this. I hope I will see you guys in the game next year. I think I'll be able to put together a better draft. Once again, thanks a ton judges. Shout out to jamas who helped familiarize me with the ATL atmosphere and provided some great insight. Thanks guys - from one tough matchup to another for me.